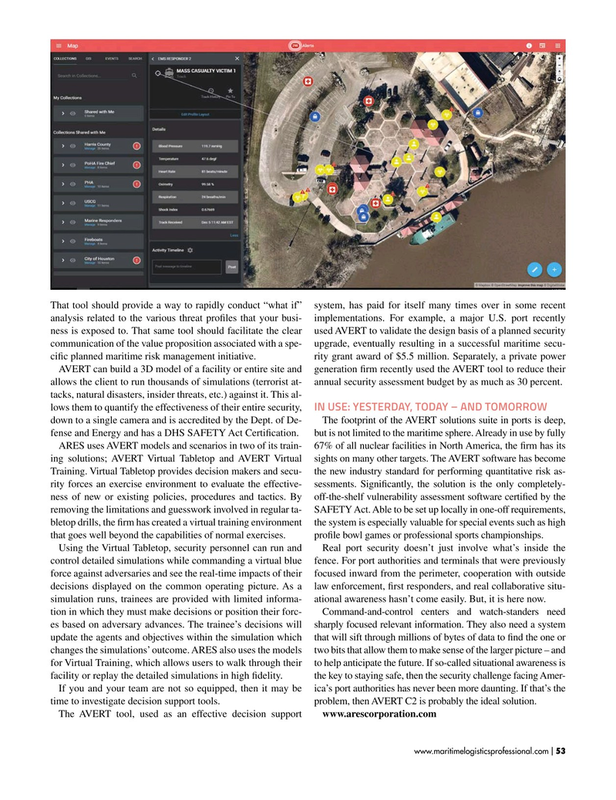 AVERT can build a 3D model of a facility or entire site and generation frm recently used the AVERT tool to reduce their allows the client to run thousands of simulations (terrorist at- annual security assessment budget by as much as 30 percent. Training. Virtual Tabletop provides decision makers and secu- the new industry standard for performing quantitative risk as- rity forces an exercise environment to evaluate the effective- sessments. Signifcantly, the solution is the only completely- ness of new or existing policies, procedures and tactics. By off-the-shelf vulnerability assessment software certifed by the removing the limitations and guesswork involved in regular ta- SAFETY Act. Able to be set up locally in one-off requirements, bletop drills, the frm has created a virtual training environment the system is especially valuable for special events such as high that goes well beyond the capabilities of normal exercises. profle bowl games or professional sports championships. Using the Virtual Tabletop, security personnel can run and Real port security doesn’t just involve what’s inside the control detailed simulations while commanding a virtual blue fence. For port authorities and terminals that were previously force against adversaries and see the real-time impacts of their focused inward from the perimeter, cooperation with outside decisions displayed on the common operating picture. As a law enforcement, frst responders, and real collaborative situ- simulation runs, trainees are provided with limited informa- ational awareness hasn’t come easily. But, it is here now. If you and your team are not so equipped, then it may be ica’s port authorities has never been more daunting. If that’s the time to investigate decision support tools. problem, then AVERT C2 is probably the ideal solution.